We know there’s a vocal set of people who just love virtual desktops. Having desktops beyond the limitations of a physical display is a powerful way to organize and quickly access groups of windows. Virtual desktops aren’t new. In fact, Xerox PARC created one of the earliest virtual desktop experiences called Rooms back in the 1980s and subsequently made a version available for Windows 3.x. Microsoft offered the Virtual Desktop Manager as part of the Windows XP PowerToys and a little while later released the Sysinternals Desktops add-on which enabled similar functionality. 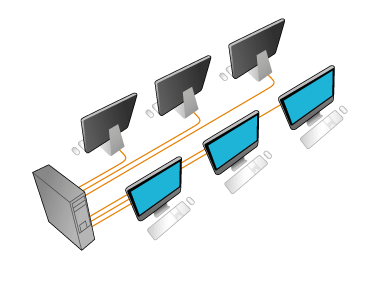 Many other OSes and third-party utilities have also embraced the power of virtual desktops. Given the growing popularity of this organizational tool, we decided to build a native virtual desktop experience directly into Windows 10. To add a new desktop simply click the task view button on your taskbar and click the “new desktop” button. Just like how you can run as many application windows as you like, there’s also no limit to how many desktops you can create. I like to run my work email and Office apps on the first desktop and open my personal browsing on my second desktop. You may find the need to have more desktops…the possibilities are endless. Task view is also where you can go to switch between desktops. The top part of this view shows previews of the windows you have open, just like Alt+Tab. However, task view also is able to filter this list when you create virtual desktops, so only the relevant windows appear. Under that you will find the list of desktops you have open. The labels along with accurate previews make it easy to find what you want to switch to. However, what if you’re trying to find that music player and you forgot which desktop you had it on? With hover preview it really is a breeze. 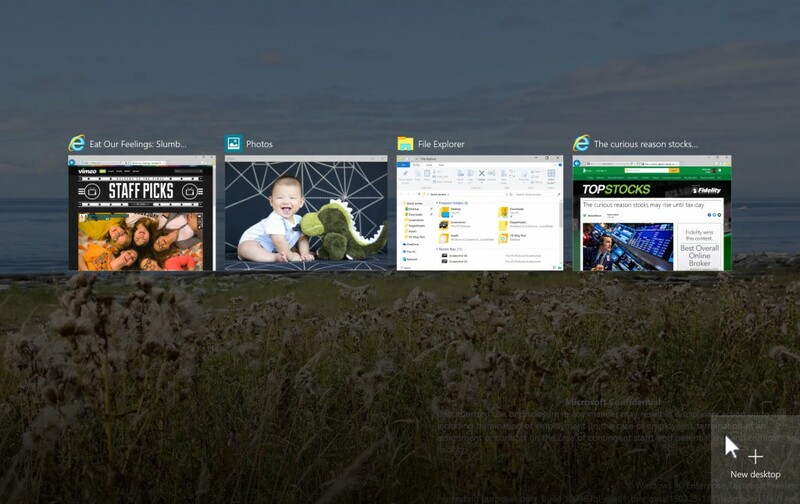 Just hover over each desktop preview and Windows will let you peek into any desktop to see what windows are open there. That’s right, no need to switch to one desktop at a time to search for the window you’re looking for! You can even click on the app preview from task view to bring that window straight to the top. We know from time to time you may want to re-organize which windows go on which desktop. Of all the virtual desktop feedback provided by Windows Insiders since the January Tech Preview (build 9926), over 63% of requests were in regards to making it easier to move windows across desktops. We heard you loud and clear! We decided to expedite drag-and-drop support in our schedule so that we could provide Insiders with the feature sooner. You can now drag any window into the desktop you want to move it to right from task view. You can even drag a thumbnail to the “new desktop” button to create and move it to a new desktop in one step. For the keyboard inclined users, you’ll appreciate some of these shortcut combos to accelerate your virtual desktop experience. One of the most divided opinions about virtual desktops is what windows are represented on the taskbar. On one side, some users want stronger separation between desktops and expect to see open windows that are only on the current desktop. On the flip side, other users expect the taskbar to always give them access to all their open windows no matter where they are. We are convinced both options are valid so we made it a user setting (actually one for the taskbar and another for Alt+Tab). The hard part is choosing which one is the default so we think the only option is to let you decide. In the most recent flight we are A/B testing the taskbar behavior with the Insiders. If you get a notification asking how you like the taskbar behavior when using virtual desktops, be sure to let us know. Your votes play a direct role in helping us decide! We’re eager to see the results. We’re glad you’re coming on this journey with us to embed the power of virtual desktops natively in Windows 10. We love the thoughtful input you sent us through the feedback channel and we look forward to your continued thoughts. Over the course of the upcoming flights you can also expect polish and reliability updates to virtual desktops in anticipation of our summer release.